Combine your solicitor training with an LLM. Gain specialised legal knowledge and stand out in a competitive jobs market. If you want to practise as a solicitor in England and Wales (or another common law jurisdiction) you need to complete your Legal Practice Course (LPC). By combining these studies with an LLM, you will gain masters-level legal research skills that can help you stand out in a competitive jobs market. The LPC element of this course will prepare you for life as a solicitor. You’ll develop the practical skills you need from our experienced tutors who are legal professionals themselves. They understand what it takes to succeed in a legal career. The LPC meets the academic requirements of the Solicitors Regulatory Authority (SRA). The research element of the LLM is a chance to gain in-depth knowledge of a legal area that interests you. You’ll develop advanced research skills that can lead to a career in academia as well as legal practice. Our staff have varied specialisms and you could learn from some of the leading researchers in fields such as human rights, discrimination law and equality law. Two qualifications in one – qualify as a solicitor and graduate with the LLM to help you stand out from other legal professionals. Funding support – study for an LLM alongside your LPC and you could be eligible for a postgraduate loan. This funding isn’t available if you just study for the LPC. Research skills – develop valuable legal research skills and take the opportunity to gain detailed knowledge of a legal specialism of your choice. Legal services hub – Manchester is the second largest legal sector in the UK. Study in this thriving legal environment. Specialist facilities – access our LPC study suite and legal libraries. We also have a mock courtroom in our well-equipped Law School. Professional guidance – we run a practitioner mentor scheme. You’ll have a direct link to someone in practice who can support you throughout your LPC studies. Globally recognised – the LLM is recognised around the world, while the LPC will allow you to practise as a solicitor in England and Wales and other common law jurisdiction countries. Build experience – volunteer through our extensive network of partners to build up your experience while you’re training. 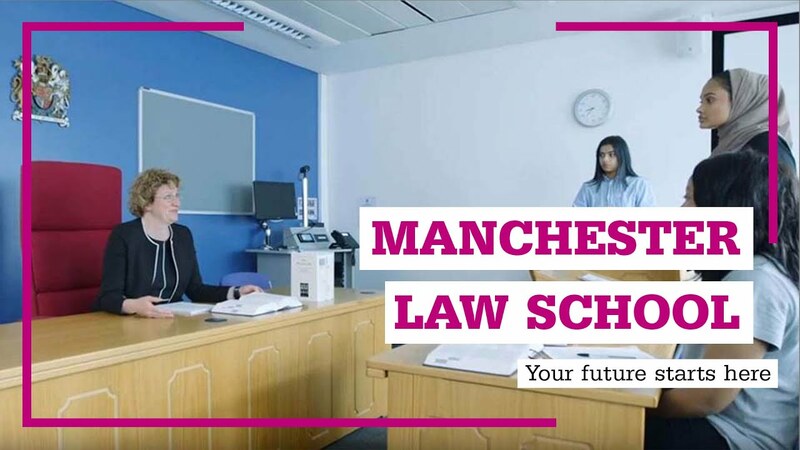 "The best reasons to study at Manchester Law School are the facilities, the amazing personal tutors, and the connections they have with law firms." Anjali Patel, LPC and LLB Graduate. With your LPC you’ll be ready to practise as a solicitor. But with the LLM you’ll have more varied career options – including a qualification that’s recognised around the world. The masters level means you come away with detailed knowledge of a specialist area of the law. That’s a great stepping stone to more specialised legal roles. It will also give you legal research skills, which are useful in many settings. If you find you have a passion for legal research, you’ll be ready to explore PhD study and can look into academic career routes. Throughout your studies you’ll be supported by highly experienced tutors. Everything you learn will be related back to legal practice. You can further improve your CV by getting involved in pro bono work through our network of legal partners. You’ll also have support from our dedicated careers and employability service. You will have a qualifying law degree or GDL, or exemption granted by the Solicitors Regulations Authority (SRA). If you intend to practise as a solicitor in England and Wales you need to look at the SRA website www.sra.org.uk/home for the requirements to enter the profession. If you intend to practise in another jurisdiction you will need to find out the requirements to do so. The LPC element of the course is designed to prepare you fully for life as a solicitor. It’s practical, interactive and delivered by experienced legal professionals who understand what it takes to succeed in the workplace. There’s an emphasis on real-life legal scenarios, so you’ll be able to try your hand at everything from interviewing clients and writing letters of advice, to preparing legal documents and appearing in court. This means you’ll learn to think and behave like a professional as you develop the knowledge, skills and commercial understanding to thrive in today’s legal environment. With our innovative study combination, you’ll also complete the LLM, an internationally recognised masters – in the same time that it usually takes to gain either qualification. The LLM will allow you to specialise in an area of the law of particular interest to you, expanding your knowledge in line with your professional or academic goals. You’ll also develop advanced critical and analytical skills as you carry out an extensive research project. You’ll be supported through the process by specialist researchers at the forefront of their field, people who are shaping the legal environment in areas like human rights, discrimination, medical ethics and free movement. The facilities at Manchester Law School are second to none. You’ll be able to make the most of exclusive postgraduate study areas, LPC study suite and comprehensive legal libraries – there’s even a mock courtroom on site where you can hone your oral presentation and advocacy skills. We have strong links throughout the sector and offer a mentorship scheme as well as competitive work placements. So you can make a start on building your experience and your professional network while you’re still studying. Or why not put your skills to the test by volunteering through our Pro Bono Network? Not only will you make a valuable contribution, you’ll also improve your CV. It all adds up to a combined course that can make a real difference to your career. The LPC will set you on the professional path to becoming a solicitor, while the LLM shows that you have the intellectual drive and dedication to succeed in your chosen area of law – setting you apart from the crowd. For the LPC element, you’ll study a comprehensive selection of core units, designed around the key areas set out by the Solicitors Regulation Authority. From there, we have a range of professionally relevant option units you can study. You’ll pick three – letting you shape your studies around your career ambitions and legal interests. For the LLM element you’ll work on a dissertation or Research Project – developing the research methods and working on an assessed research proposal, then doing the project itself. PLEASE NOTE: Each option unit will only be available if enough students choose to study it. Property Law and Practice workshops will be based primarily on a 3-link chain of residential conveyances. Students will hold files for the 2 joint sellers/buyers in the middle of the chain. You will progress these files from taking initial instructions to completion and post-completion formalities. In this way you will appreciate the nature of a property transaction and be able to identify and perform the critical steps in a transaction. On completion of this unit, you will gain an understanding of the nature and structure of the different business media. You will be able to select an appropriate medium and structure to meet the client's commercial requirements and to advise on the legal and taxation implications. You will also be able to progress basic business transactions arising during the life and development of a business, and gain an understanding of the interests of different parties involved in the business including directors, shareholders and creditors. In the civil litigation workshops you will deal with civil disputes looking at case studies about breach of contract and negligence from receipt of initial instructions through to trial and enforcement of judgments. Along the way you will learn about the Civil Procedure Rules so that you understand their objective and application in litigation cases. In the criminal litigation workshops you will advise on a range of offences at different stages of the criminal litigation process from detention by the police to the procedures leading to magistrates and crown court trial, evidence and sentencing. This will equip you to identify the steps and strategies that need to undertaken in the preparation and conduct of criminal litigation. Money Laundering incorporating The Money Laundering Regulations. You will learn about the Solicitors Accounts Rules, how to deal with office and client money and the requirements in respect of trust monies. You will progressively develop your ability to draw up and interpret accounts and to identify and apply the relevant parts of the Solicitors Accounts Rules to ensure compliance with your professional responsibilities. This unit will give you n a general overview of the content, format and validity of wills, obtaining grants of representation and administration of an estate by way of a combination of face-to-face teaching as well as by supported study including directed reading and on-line teaching. Your learning experience has a strong practical element and you are encouraged to consider issues such as client care and the rules of professional conduct where relevant. You will be introduced to the principles and criteria that underpin effective practical legal research, together with a range of general research skills Teaching will revolve around case-studies in which students will be required to undertake different research problems in a range of legal contexts, using appropriate paper and electronic resources and tools. In this way you will understand that effective Practical Legal Research skills and knowledge are necessary in all legal practice areas. There will be interviewing and advising teaching in workshops across all the core subjects in terms of "real life" case studies and documents so that you will learn the skills necessary to conduct a legal interview and give legal advice as you would do in all areas of legal practice. You will gain an understanding of the principles that underpin effective legal advocacy and good practice. Teaching will be primarily in the context of Civil and Criminal litigation, however, advocacy skills also can be transferred to in any area of legal practice where presentation skills are used. Writing is a skill developed in workshops in core subject areas using case studies and to acquire the skills necessary to communicate effectively in the context of solicitors practice. You will be required to research legal problems and then write using the appropriate medium tailored to suit the purpose of the communication and the needs of the recipient. Taxation impacts on many areas of solicitors practice and in this unit you will acquire a sufficient grasp of tax law concerning Income Tax, Capital Gains Tax, Inheritance Tax, Corporation Tax, Vat and Capital Allowances to be able to use your knowledge to give initial advice in context of the core of the course. The unit integrates the workplace into the curriculum using case studies to develop your skills in a practical context. Our dedicated careers advisor is on hand to put you in touch with legal firms, so you can develop your own opportunities for gaining experience and building your network. Many of our tutors and staff members are practising professionals, ready to support you with careers advice and opportunities. As part of the Manchester Law School, our LPC with LLM students have the opportunity to get involved in voluntary work through the Pro Bono Network. Work with one of our partners and you won’t just be offering free expertise to people in need – you’ll also have the chance to build real skills and relevant experience. UK and EU students: Full-time fee: £10,500 per year. Tuition fees will remain the same for each year of your course providing you complete it in the normal timeframe (no repeat years or breaks in study). UK and EU students: Part-time fee: £1750 per 30 credits studied per year. Tuition fees will remain the same for each year of your course providing you complete it in the normal timeframe (no repeat years or breaks in study). Non-EU international and Channel Island students: Full-time fee: £12,000 per year. Tuition fees will remain the same for each year of your course providing you complete it in the normal timeframe (no repeat years or breaks in study). Non-EU international and Channel Island students: Part-time fee: £2000 per 30 credits studied per year. Tuition fees will remain the same for each year of your course providing you complete it in the normal timeframe (no repeat years or breaks in study). In addition to tuition fees, a registration fee of £15 is payable in year 1. Full-time applications are via the Central Applications Board from the 1st October in the academic year prior to enrolment. Part-time applications download our course application form. There are instructions on what to do next and who to send the form to in the Word document.